While sectarian violence has greatly diminished on the streets of Belfast and Derry, proxy battles over the right to define Northern Ireland’s identity through its new symbolic landscapes continue. 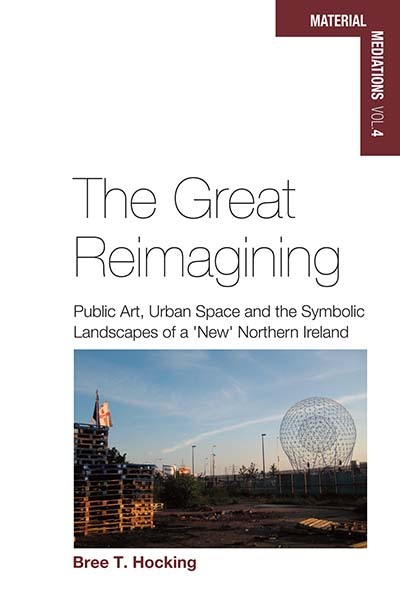 Offering a detailed ethnographic account of Northern Ireland’s post-conflict visual transformation, this book examines the official effort to produce new civic images against a backdrop of ongoing political and social struggle. Interviews with politicians, policymakers, community leaders, cultural workers, and residents shed light on the deeply contested nature of seemingly harmonized urban landscapes in societies undergoing radical structural change. Here, the public art process serves as a vital means to understanding the wider politics of a transforming public sphere in an age of globalization and transnational connectivity. Bree T. Hocking is an anthropologist and journalist who writes on the intersection of art, spatial politics, and society. Her work has appeared in numerous journals and media outlets including Anthropology Matters, BBC Radio 4, and Roll Call, where she was formerly a staff writer. She received a Ph.D. from Queen’s University Belfast, and in 2013 was the recipient of an Irmgard Coninx Foundation fellowship to carry out research related to the artistic transformation of the Berlin Wall.